Turns out you don’t have to travel too far for some good ole southern cookin’. You don’t even have to be a hipster at Smorgasburg in Brooklyn to get your hands on a vegan delicacy such as Chicken & Waffles. 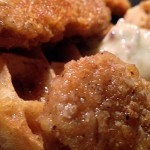 This is a great dish you can make for your friends and family, for breakfast, or dinner. I’ve always been a fan of clashing, unexpected savory/sweet flavors. This vegan recipe is actually a modification from one of Bobby Flay’s Throwdown show competitions, but without the dairy/buttermilk, or meat. 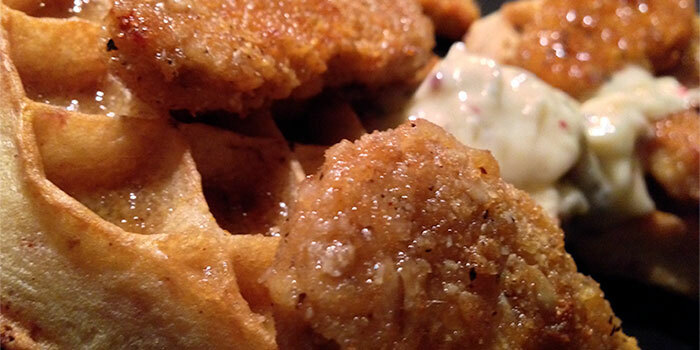 There are plenty of recipes out there for vegan waffles but let’s be honest, we’re hungry. 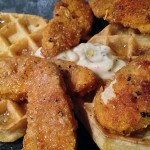 For time purposes, decided to try Van’s (Totally Natural) gluten-free waffles with Gardein seven-grain crispy tenders (found at Target). The result, outstanding! Prepare your mouth’s field of tastebuds for a battle between this savory-sweet delight. Mix together garlic powder, onion powder, paprika, cayenne and pepper. 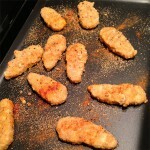 Sprinkle to coat both sides 4-6 pieces of seven-grain crispy Gardein chicken. Place chicken on baking sheet in oven on 450 degrees, for 20-25 minutes until golden brown, flipping once. 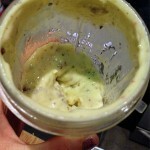 Combine butter, pink peppercorns, vegan honey, salt, pepper in a blender until combined. In a small bowl, whisk together maple syrup, horseradish, and mustard. 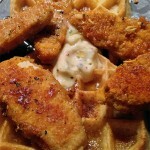 Prepare waffles as instructed before plating, top with 2 pieces of chicken, dollop of butter, and then pour syrup on top.